The mighty sun has both the good as well as the bad side! Sunrays help the body make vitamin D, which is important for your immunity. It also regulates sleep cycles, enhances feelings of well-being and aids many other bodily functions. But, as anything in excess is bad, the same goes with overexposure to sunrays. When you spend too much time in the sun, it can cause darkening of the skin. When your skin senses ultraviolet (UV) rays from the sun, it produces melanin to protect itself. This causes your skin to become darker. Some people think they look better with tanned skin. 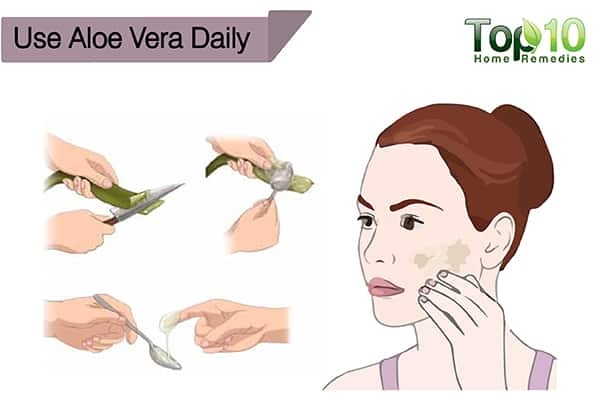 But you must not take darkening of the skin lightly, as it is also a sign of skin damage that can lead to a sunburn, unsightly sun spots, wrinkles and, in some cases, skin cancer. Whether your skin is light, dark or somewhere in between, everyone is at risk for skin cancer. 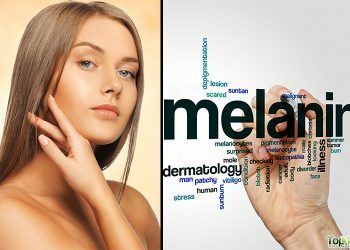 According to a 2016 study published in the Journal of the American Academy of Dermatology researchers found that African American patients were most likely to be diagnosed with melanoma in its later stages than other racial groups, and they also had the worst prognosis and the lowest overall survival rate (1). No matter what time of year it is, you need to take necessary steps to protect your skin from darkening in the sun. And if it does happen, some of these remedies will also help restore your skin to normal. Here are the top 10 ways to protect your skin from darkening in the sun. 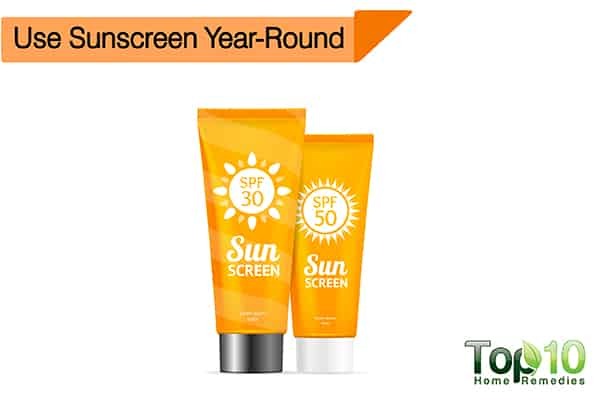 The first line of defense against skin darkening due to sun exposure is applying sunscreen year-round. Sunscreen stops UV radiation from passing through to your skin, protecting it from damage. The American Academy of Dermatology says that to get the protection you need from the sun’s harmful UV rays, use a sunscreen that offers SPF 30 or higher, broad-spectrum protection, and zinc oxide or titanium dioxide (2). In a 2011 study published in the Journal of Clinical Oncology, researchers found that regular sunscreen use reduced the incidence of melanoma by 50 to 73 percent. When used as directed with other sun-protection measures, broad-spectrum sunscreen with an SPF of 15 or higher helps prevent sunburn and reduces the risk of early skin aging and skin cancer (3). Also, a 2018 study published in PLOS ONE recommends double application of sunscreen lotion, especially before intense sun exposure (4). Look for a broad-spectrum sunscreen, which protects against UVA and UVB rays, with an SPF of at least 30. 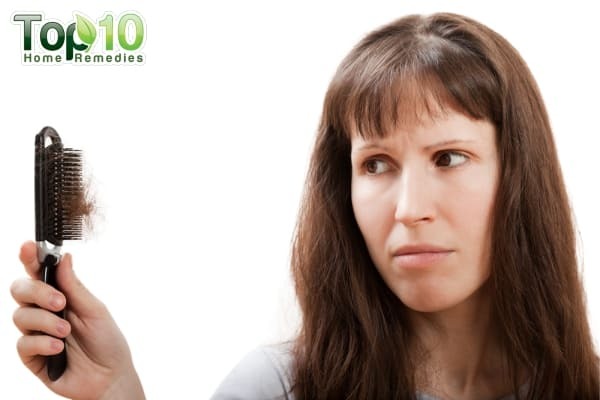 You can even opt for sunscreen gels that are good for hairy parts of your body, like your scalp. Apply sunscreen 20 or 30 minutes before going outdoors, and use at least 1 ounce of sunscreen at each application. Reapply after swimming, activities that caused you to sweat or every 2 hours. When applying sunscreen, give special attention to the nose, tips of your ears, scalp and lips. The cosmetics that you choose to use in your daily routine can also go a long way in protecting your face against UV damage. 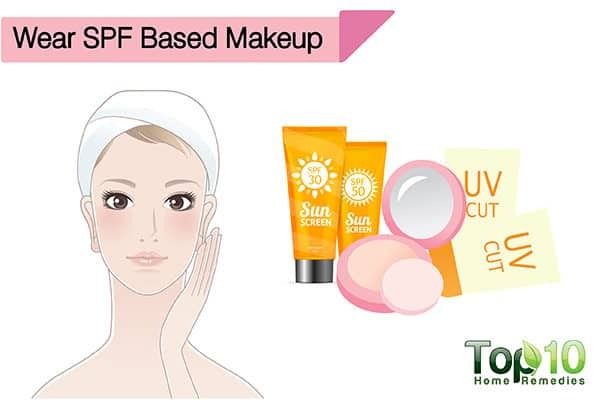 Apart from sunscreen, there are moisturizers, bronzers, foundations and lipsticks that are available in the market with built-in sun protection. So, all you need to do is choose cosmetics that have an SPF rating of at least 15. For instance, you can select a sunscreen-containing moisturizer that has a list of active ingredients like zinc oxide, avobenzone, or ecamsule combined with octocrylene and avobenzone. These are the most cosmetically elegant, long-lasting and broad-spectrum sunscreen ingredients found in moisturizers. It’s important to keep in mind that cosmetics should not be used as the sunscreen component of your comprehensive sun-protection regimen. Never forget to apply a base layer of sunscreen on your face before applying makeup. Not just sunscreen and makeup, the clothes you choose to wear when you go out in the sun also play a major role in protecting your skin. 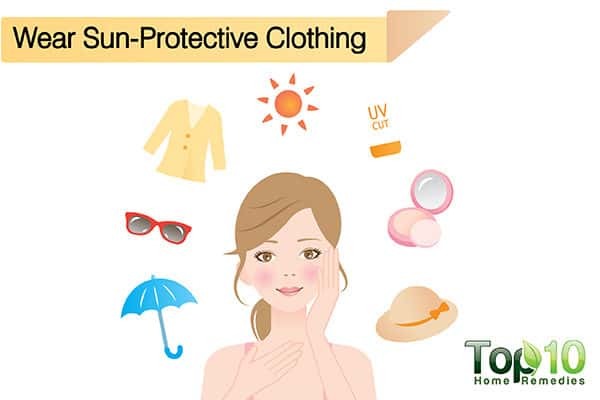 Not all clothes provide a measurable amount of sun protection. However, certain fabrics are specifically designed to protect you from the sun’s harmful UV rays. For instance, dark clothes with a tight weave will provide more protection than light-colored and open-weaved clothes. When going out in the sun, be sure to wear long sleeves, long pants and high collars so that most of your skin is covered. At the same time, to protect your face, wear a wide-brimmed hat. A hat with a brim that is at least 2 to 3 inches wide is ideal. Also, do not forget to protect your eyes by wearing sunglasses. Wear sunglasses that wrap around the sides of your face. The pulp inside the leaves of the aloe vera plant is an excellent ingredient to protect your skin from damage caused by UV sunrays. Aloe vera helps treat hyperpigmentation and can lighten tanned skin. It also has deep skin-moisturizing properties that add a glow and shine to your skin. A 2017 study published in the International Journal of Pharmacognosy reports that aloe vera may suppress the release of melanin and reduce pigmentation (5). Extract fresh aloe vera gel from a leaf. Rub the gel on your skin for 5 minutes. Allow the gel to do its work for 30 minutes. Caution: Avoid going out in the sun after using aloe vera on the skin. 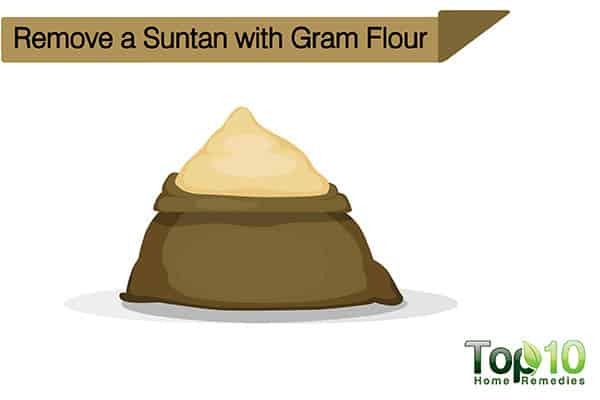 If you have tanned skin due to being out in the sun, you can exfoliate your skin with gram flour. Exfoliating removes the top layers of tanned skin, revealing the new skin underneath, which is soft and supple. A gram flour scrub will help remove the dead and darkened skin cells, thus lightening your skin tone. Mix together 1 tablespoon of gram flour and 1 teaspoon of plain yogurt. Apply the paste all over the suntanned skin. Allow the paste to dry for 15 minutes. Once it dries, gently scrub it off, then rinse your skin. Use this treatment once or twice every week for effective results. 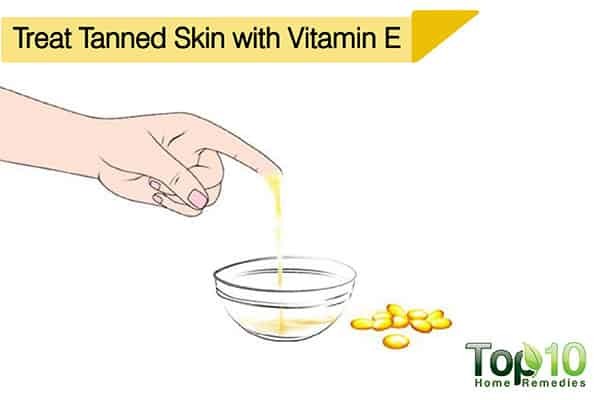 For removing a tan from your skin, vitamin E is very effective. Being an antioxidant, it neutralizes the effects of harmful UV sunrays, and repairs and protects the skin. Also, it helps keep the skin moisturized. A study published in the Journal of the American Academy of Dermatology in 1998 reports that combined vitamins C and E reduce the sunburn reaction, which might indicate a consequent reduced risk for later sequelae of UV-induced skin damage (6). Prick 2 vitamin E capsules and squeeze the contents into a bowl. Add a few drops of castor oil to it and mix well. Before going to bed, apply the mixture on your skin. Massage gently using circular motions for 5 to 10 minutes. The next morning, wash your skin well with lukewarm water. Coconut water is a refreshing drink for summer days. It can quench your thirst and also protect your skin from darkening after being exposed to UV rays of the sun. 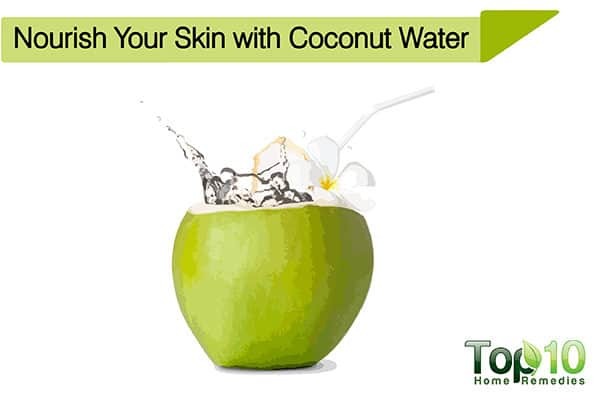 Coconut water nourishes and hydrates your skin to keep it soft and smooth, and benefits your tanned or darkened skin. Apply fresh coconut water on the suntanned areas and let it dry. Again, apply some more coconut water and allow it to dry. Repeat the process at least 3 times within 30 minutes. Wash the areas with cold water after 30 minutes. Repeat the process for a few days to restore your skin’s health. 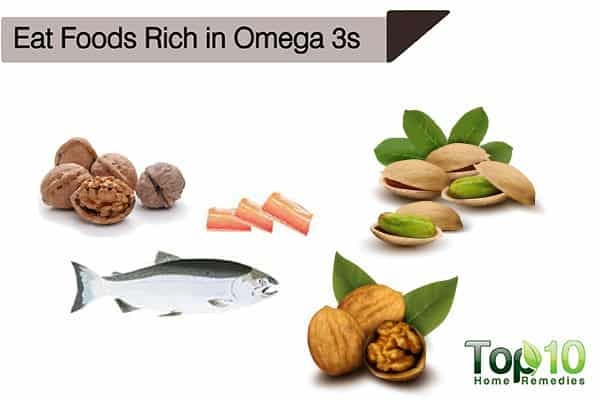 Eating foods that are rich in omega-3 fatty acids may also help protect your skin from darkening from the sun. Fatty acids work as natural emollients that revitalize dry skin. They also have anti-inflammatory properties that reduce redness and swelling in the skin due to sun exposure. 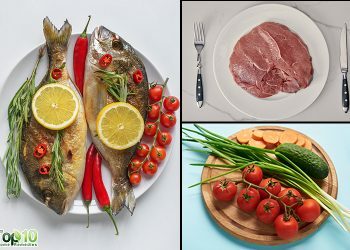 A 2001 study published in the American Journal of Clinical Nutrition reports that supplementation of the habitual diet with vitamins, carotenoids or polyunsaturated fatty acids, or a combination thereof, may protect the whole body against UV irradiation-induced damage (7). A 2013 study published in the American Journal of Clinical Nutrition reports that taking omega-3 fish oils could help protect against skin cancer (8). Some foods rich in omega-3 fatty acids include salmon, halibut, algae, nut oils, and chia and hemp seeds. You can opt to take an omega-3 supplement, but only after consulting your doctor. Lycopene that’s found in abundance in red foods like tomatoes can also help protect your skin from UV damage. When you eat tomatoes, you are adding lycopene to your diet. Lycopene is a carotenoid and antioxidant that neutralizes the free radicals produced from too much sun, and minimizes any inflammatory response by your body to UV damage. A 2001 study published in the Journal of Nutrition reports that it is feasible to achieve protection against UV light-induced erythema by ingestion of a commonly consumed dietary source of lycopene (9). 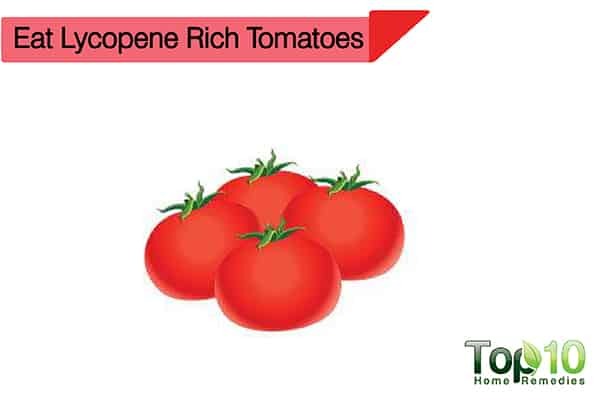 To get the sun-protection benefits from lycopene, cook tomatoes only in a small amount of oil. For healthy and flawless skin, it is important to keep the skin well hydrated from within. A well-hydrated body helps increase cell turnover and allows your skin to rejuvenate itself. This plays a key role in removing tanned skin. 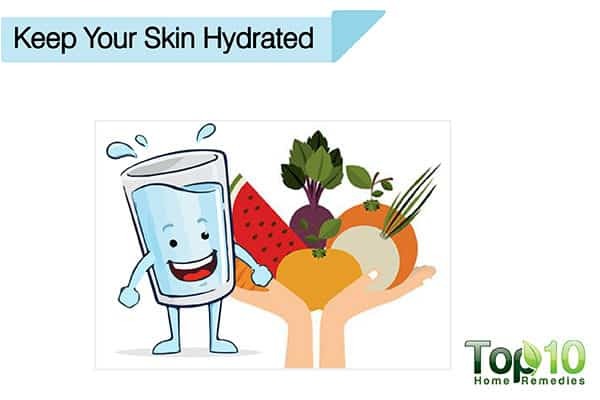 Hydrate your skin internally by drinking plenty of water and eating fresh fruits and vegetables that are high in water content. At the same time, avoid soda, alcohol and coffee, as they have a dehydrating effect on the body. Also, after washing your face, do not forget to use a moisturizer with SPF protection. 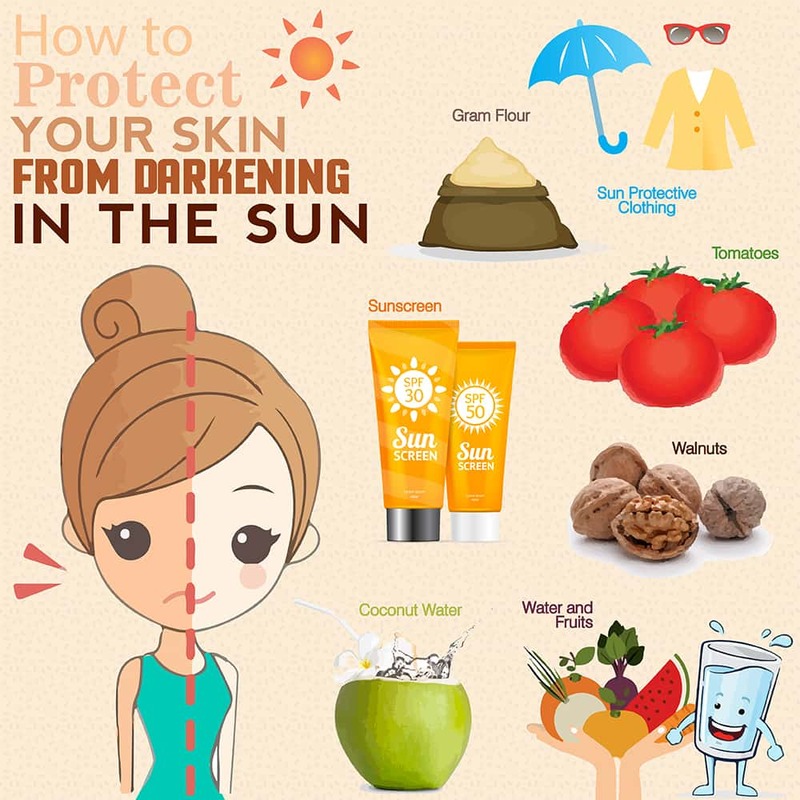 To protect your skin from darkening you need to avoid reflected sunlight, too. Some of the most reflective surfaces are water, snow, sand and concrete. Keep an eye on the UV index, which highlights the strength of the sun’s UVA and UVB rays on any given day. Stay out of the sun when it’s strongest, which is between the hours 10 a.m. and 4 p.m. When possible, stay indoors during this time. Schedule outdoor activities and trips for the early morning or late afternoon instead of midday. When you do have to be outside in the sun, stay in the shade as much as possible. There is no such thing as a “healthy tan”, so you need to avoid sunbathing, especially during the summer season. Certain drugs like tetracycline and diuretics can make your skin extra sensitive to sun exposure and increase the risk of sunburn. Be aware of these drugs. UVA rays from tanning beds penetrate the skin even deeper than UVB rays and increase the risk of skin cancer. So, it is better to avoid tanning beds. Eat more antioxidant-rich foods to provide some protection against the sun’s rays. Fill up on fruits and vegetables, and drink plenty of green tea for maximum protection for your skin. Racial disparities in melanoma survival. Journal of the American Academy of Dermatology. http://www.jaad.org/article/S0190-9622(16)30380-2/abstract. How to fade dark spots in skin of color. American Academy of Dermatology. https://www.aad.org/public/skin-hair-nails/skin-care/skin-of-color. Reduced melanoma after regular sunscreen use: randomized trial follow-up. Journal of Clinical Oncology. https://www.ncbi.nlm.nih.gov/pubmed/21135266. Published January 20, 2011. Sunscreen use optimized by two consecutive applications. PLOS ONE. https://www.ncbi.nlm.nih.gov/pmc/articles/PMC5874020/. Published 2018. Botanical Study of Skin Lightening Agents. International Journal of Pharmacognosy. http://ijpjournal.com/bft-article/botanical-study-of-skin-lightening-agents. Protective effect against sunburn of combined systemic ascorbic acid (vitamin C) and d-alpha-tocopherol (vitamin E). Journal of the American Academy of Dermatology. https://www.ncbi.nlm.nih.gov/pubmed/9448204. Published January 1998. Nutritional skin care: health effects of micronutrients and fatty acids | The American Journal of Clinical Nutrition | Oxford. OUP Academic. https://academic.oup.com/ajcn/article/73/5/853/4739553. Published May 01, 2001. Taking omega-3 supplements may help prevent skin cancer, new study finds. ScienceDaily. 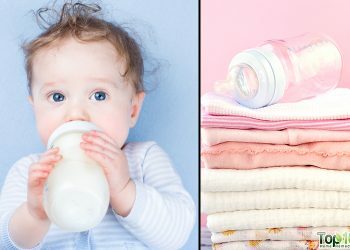 https://www.sciencedaily.com/releases/2013/02/130226092002.htm. Published February 26, 2013. Dietary Tomato Paste Protects against Ultraviolet Light–Induced Erythema in Humans | The Journal of Nutrition | Oxford Academic. OUP Academic. https://academic.oup.com/jn/article/131/5/1449/4686953. Published May 01, 2001.